The Maurice Wilkins Centre and Ngati Porou Hauora recently co-organised ‘Tātai Oranga: Joining forces to tackle metabolic conditions,’ a landmark conference held on the North Island’s East Coast. Tātai Oranga was held at Iritekura Marae, Waipiro Bay, and in Gisborne, from 4 to 6 April 2018. Attended by a large number of local community and iwi members, it featured presentations by leading scientists and clinicians in the metabolic disease field from around New Zealand and overseas. 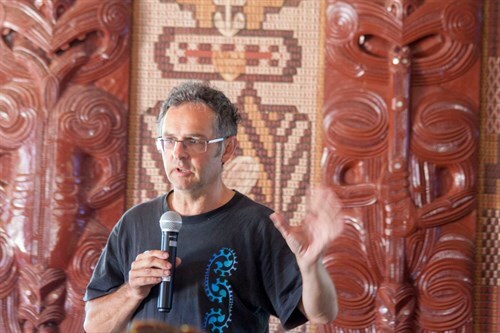 Speakers covered a range of topics, including the first public disclosure of results from the Centre’s studies of Māori/Pacific specific gene variants. Among the MWC speakers were Professors Tony Merriman, Dave Grattan, Phil Wilcox, and Peter Shepherd. 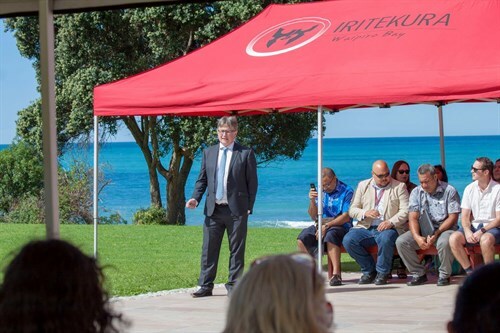 Professor Peter Shepherd, Deputy Director of the MWC, makes a speech to attendees on the grounds of the Iritekura Marae, with the magnificent Waipiro Bay as a backdrop. Professor Tony Merriman talks about the MWC Metabolic Disease Flagship programme and its research findings. A key outcome of the meeting was the ‘Tātai Oranga Declaration’ – a new strategy to work in a more integrated way to optimise the impact of our metabolic disease research in New Zealand. For more details about the conference, see articles in the Gisborne Herald and New Zealand Doctor. Professor Kath McPherson, Chief Executive of the Health Research Council (HRC), said she felt energised by the level of community interest and engagement after attending the event, according to an article in the HRC newsletter. “There was a palpable sense of wanting to see quality research that delivers meaningful results, and to see researchers connect more with small communities, to identify the questions that matter and how best to translate research into change," Professor McPherson was quoted as saying. “This meeting didn’t just happen - it was a lot of work by Ngāti Porou Hauora, the country’s smallest PHO – and the Maurice Wilkins Centre, one of the country’s dedicated Centres of Research Excellence.